Need a hand composing a brilliant school counselor resume? Find your free downloadable sample resume and our expert writing tips below. School Counselor with 5+ years of experience providing guidance to students aged 14–18 regarding career development, academic achievement, social behavior, and mental and physical health. Recognized for ability to build rapport with students and collaborate with teachers and parents to establish effective support networks. 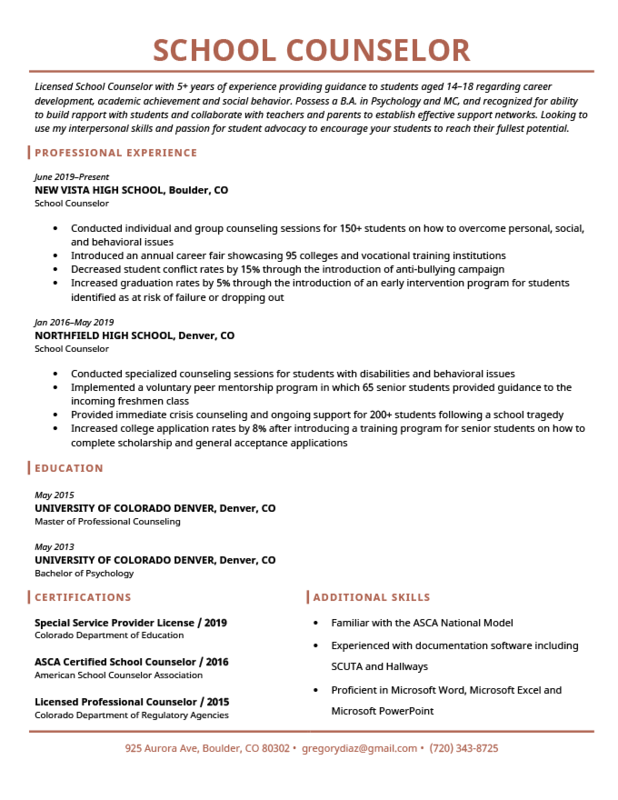 Looking to use my Bachelor of Psychology and Master of Professional Counseling to cultivate a stimulating and supportive environment to allow the students at your school to reach their fullest potential. Working as a school counselor is a meaningful, diverse, and challenging career opportunity. Standing on the frontlines of youth development, school counselors play an integral role in the education system in the U.S.
As a school counselor, you are an advocate for career development, academic achievement, social behavior, and mental and physical health for youth. You are in a unique position to positively impact the lives of youth during a turbulent and formative period. You act as a liaison between students, parents, and teachers. Are you ready to begin a rewarding and impactful career as a school counselor? If so, you have come to the right place. Use this resume sample and these three easy-to-follow tips to craft the perfect school counselor resume. On the other hand, if you are pressed for time, suffering from writer’s block, or just hate writing resumes, no problem! You can skip right to the finish line with our state of the art resume builder. Your Career Objective is likely the first thing the hiring manager will see when they pick up your resume. Think of it as your way to make a great first impression with your potential new employer. If you do it correctly, it will be the hook that reels the hiring manager in for the rest of your resume. “You never have a second chance to make a first impression” certainly holds true for the Career Objective on your resume. Spend the extra time to make it stand out and leave a lasting first impression. Trust us, if you are selective with each and every word, three lines is more than enough! The first line should showcase the number of years you have worked as a school counselor. If you are new to the profession, use this line to feature the years of experience you have working with youth in other roles. Next, provide a high-level overview of the duties you performed in the role in the same line. The second line is all about you! What qualities do you possess that make you a desirable candidate for the school counselor position? Think about the hard and soft skills you have used to excel in your previous positions. The third and final sentence is the perfect opportunity to show off your educational background and reassure the hiring manager you are qualified for the position. Making a difference in even one life makes the job worth it. Not sure what skills to include on your resume? No problem, we’ve got you covered with our guide to Hard & Soft skills. If you are pursuing a career as a school counselor, you have undoubtedly spent many years in university preparing for the role. Typically, school counselors must hold an unspecialized bachelor’s degree and a master’s degree specific to counseling. According to a recent survey, 93% of school counselors in the U.S. have a master’s degree. The high level of education required for school counselors is great news for U.S. schools. Everyone can rest assured that competent, qualified professionals are responding to the needs of youth today. Unfortunately for you, this means that the Education section of your school counselor resume probably looks the same as everyone else’s. But don’t fret! By following the tips below, you can diversify your resume and stand out from the crowd. A critical success factor for school counselors is the ability to relate to, communicate with, and understand students. Your school counselor resume should demonstrate that you have a robust set of soft skills to back up your education and work experience. Soft skills can be defined as the attributes and traits—such as interpersonal skills—that affect your ability to interact with others. Soft skills occur naturally and are hard to quantify or measure; they include interpersonal skills, the behaviors and qualities that allow you to successfully interact with others. This does not mean that they should be left off your school counselor resume—it should be littered with soft skills, providing the hiring manager a preview of how well you work with others. Having trouble thinking of soft skills for your resume? Check out, the Top 10 Soft Skills Employers Love: 90+ Examples. You are officially ready to craft your own school counselor resume. If you have any questions, please comment below, and a member of the resume genius team will reply. Feel free to check out our wide range of resume templates to increase your chances of landing a great job. And if you’re in a hurry, you can also try out our resume generator to create a high-quality resume within minutes.